Still nobody seems to have actually said that 0° Long is (directly??) facing Charon and thus this heart-feature is right about opposite. Doesn’t seem accidental that two of the sticking features of the planet line up towards and away from the tidally locked planet! These two features look more to do with the rotation of Pluto than the tidal lock. Just draw two circles, one for the faced and one for the off-faced side. So tidal lock or rotation would mean the same for causing a difference. The feature may have more to do with “revolution” than “rotation.” The heart may be ice from the atmosphere that “froze out” and fell to the surface while the two dwarfs were at the furthest point from the sun during their revolution around the sun. Let’s see what happens when we get closer during the fly bye. Hate to be nit picky, but Pluto is not the last dwarf planet to be explored in the solar system, but rather the latest. There are a few more dwarf planets left, most notably Eris. It would be foolish to assume, as most have that there are no more out there waiting to be discovered beyond the range of current technology. The gap past Neptune that marks the beginning of the Kuiper belt may have been cleared out by a large planet that could have receded in its orbit. There may well be some Neptune to Mars sized planets or smaller at a distant orbit waiting to be discovered as well as a plethora of Pluto sized dwarfs that many are already expecting to find. Based on extra-solar planet systems sun-sized stars can have large planets forming out much further than Neptune and rogue planets could have been captured in distant orbits from the birth cluster of the sun where stars were likely packed into close quarters. Such planets would have unpredictable orbits and would be very distant so impossible to find with current technology. Yeah, there might be a continuous distribution of comets and rouge planets between us and our nearest stars. Very sparse, but maybe not at all as empty as presumed. Gaia might detect some distant Oort objects with microlensing. I don’t think they waste much telescope time looking for them, and it takes a lot for a non surveying telescope to identify Oort objects. But after the exoplanet boom we might, maybe, have an Oort cloud boom. With luck, a Mars sized interstellar object might be useful for a far future space probe’s gravity assist, since such a rouge planet might have a relative speed of 100+ km/s. If we now find tons of dwarf objects near Neptune then we should downgrade Neptune to dwarf planet. 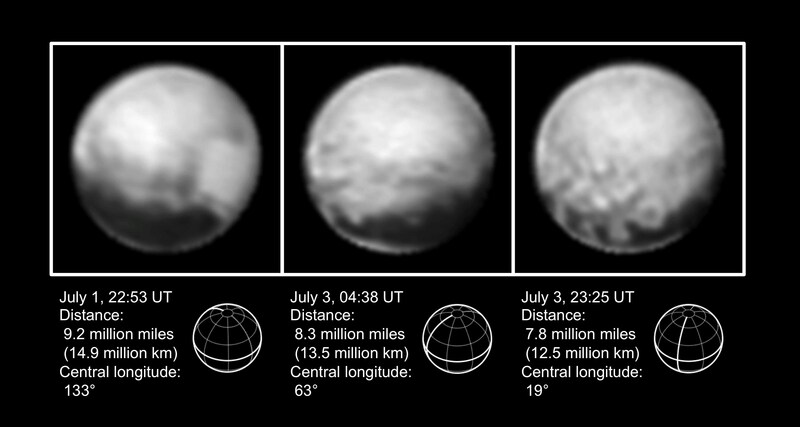 “NASA’s New Horizons spacecraft – which has also officially started its intensive flyby campaign merely 5 days out from humanity’s history making first encounter with the last unexplored planet in our Solar System on Tuesday, July 14. (emphasis mine). Soooo… Pluto is a planet again? Interesting. Any word on how it managed to regain its former status while somehow bypassing other, possibly more worthy objects, such as Eris, or Quaoar, e.g.? Or have we simply lumped the “dwarf” types in with the “regulars?” In that case, what about Haumea, Orcus, Sedna, et cetera? Have we explored them already and I just missed it? ETA: Beat me to it, Greg. 😀 Of course, I assumed he meant “planets of which we are currently aware,” but that WAS an assumption on my part…. Allow me to simplify. Whether or not one considers Pluto to be a “planet” (and I am not opposed, by the way), it simply cannot be “the last planet to be explored.” Either there are a number of other unexplored planets — the existence of which we are already well aware — or Pluto is not a planet in the first place. It is silly to call them dwarfs when they are the GIANTS among the dwarf planets. Dwarf planets ARE a subclass of planets. That was the intent of Dr. Alan Stern when he first coined the term in 1991. The four percent of the IAU that voted on this misused Stern’s term. In astronomy, dwarf stars are still stars, and dwarf galaxies are still galaxies. So too, dwarf planets are a subtype of “regulars” and should be classed with them . Pluto never stopped being a planet. The problem is that the mainstream media has treated the controversial 2006 IAU vote by four percent of its members, most of whom are not planetary scientists but other types of astronomers, as fact rather than as what it really is–one interpretation in an ongoing debate. That interpretation was immediately opposed in a formal petition by hundreds of professional astronomers led by New Horizons Principal Investigator Alan Stern. Those who signed his petition base their decision on support for a geophysical rather than dynamical planet definition. According to the geophysical planet definition, a planet is any non-self-luminous spheroidal body orbiting a star, free floating in space, or even orbiting another planet. If a celestial body is not a star itself and is large enough and massive enough to be squeezed into a round or nearly round shape by its own gravity, it is a planet. That means yes, Eris, Quaoar, Haumea, Orcus, Sedna, Makemake, and Ceres are planets; they are in the dwarf subclass of regular planets. Pluto is the last unexplored planet dating to the beginning of the space age, when none of these worlds (other than Ceres) was known. Ceres is already being explored by the Dawn mission. Since the beginning of the space age, new solar system planets have been discovered and likely will continue to be discovered. Some suspect a Mars- or Earth-sized object may lurk as far from the Sun as the inner Oort Cloud. That is a remarkably specific definition, one I’ve yet to hear from anyone except yourself. If Dr. Kremer had used it, I might have had less issue with his comment. Instead — and this was my issue all along — he made a statement that was demonstrably false on its face for sake of a good tag line. Unfortunately, even for your definition, many of these (dwarf) planets were known to exist years before New Horizons ever left the launch pad. As such, the only way to truthfully call Pluto “the last” of anything is to artificially constrain the set of explored/unexplored planets to an era which ended more than a dozen years ago… something your definition does rather neatly, I must say. It is difficult enough to describe & discuss the universe as it exists in all of its complexity and variety when we are all using the same definitions. It becomes almost impossible when those definitions become vague, fluid, or transient. The NASATV update noted that NH was moving along at within a mm/sec speed, 60×90 mile box, and trying to get within 100 sec of close approach now 4 days out from Pluto. Next PostNext What Causes Lightning?